There are at least five bands called Overdrive: 1. Swedish heavy metal band. 2. British Heavy Metal band formed in 1977. 3. Serbian HC band from Zrenjanin. 4. German disco act. 5. Romanian metal band from Bucharest. 6. Overdrive is stated as the artist for the 2007 ????? (Kira ? Kira) Visual Novel BGM. 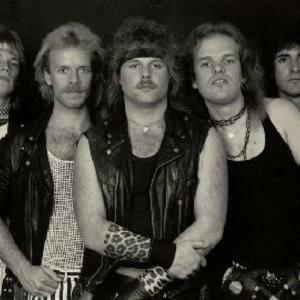 Detailed bios: 1) Swedish heavy metal band Overdrive was formed in 1980 and recorded the MLP "Reflexions" and two albums "Metal Attack" and "Swords And Axes" before splitting in 1985. 1. Swedish heavy metal band. 2. British Heavy Metal band formed in 1977. 3. Serbian HC band from Zrenjanin. 5. Romanian metal band from Bucharest. 6. Overdrive is stated as the artist for the 2007 ????? (Kira ? Kira) Visual Novel BGM. 1) Swedish heavy metal band Overdrive was formed in 1980 and recorded the MLP "Reflexions" and two albums "Metal Attack" and "Swords And Axes" before splitting in 1985. The band made a few half-hearted reunions in 1993 and 1997 before the real deal came about in 2003. The band returned with a new MCD, "Resurrected" in 2006 and a new album, "Let The Metal Do The talking" in 2008. A new album is due 2010 and lots of shows have been booked. The line-up features Per "PerilOz" Karlsson: vocals, Janne Stark: guitar, Kjell Jacobsson: guitar , Kenth Ericsson: bass, and Kenta Svensson: drums. 2) Overdrive was formed in May 1977 by Tracey Abbott (lead guitar), Ian Hamilton (bass guitar + main vocal), Neil (mad dog) Streets (percussion), and Paul Garner (rhythm guitar). The lineup changed the year after. The band split in 1987, only to reform in 1988. But from 1988 until 1994, there were several lineup changes that culminated in Tracey leaving the band, putting an end to Overdrive for what seemed for good. But the band reformed in 2004 when they realized that their old EP from years past was getting recognition. They have released 5 albums since 2005. 3) Overdrive was formed in 1994 by Dragan Midorovic - Gagy, the frontman of the band. In 1994 Aleksandar Midorovi? (guitar) and Damir Milutinov ? ?vare (vocal) joined the band and Overdrive became HC oriented with distinctive vocal, who gave the band a trademark sound. Their first album "No More Words" was eventually released in 1997 for Boa Records, and it was followed by live show in Zaje?ar, Concert of the Year in Novi Sad and numerous festivals with their own audience. Overdrive released their second album "Everything's fine" in 2000, also for Boa Records, but with slight delay. In 2000 the band went through lineup change (bass guitar & drums), but the band's style retained unchanged. Overdrive performed live with bands Pro-Pain in 1998 and 1999, Gurd (CH), Fury Of V (New York, USA), and also played concerts at EXIT Festival (2002 - 2009), concert with Soulfly in February 2003, as well as gig with The Prodigy in Belgrade in 2005, and at EXIT Festival on the Main Stage with Ko?n. Third studio album "Movement" was released in March 2004 for national record label PGP-RTS. Amongst 10 new songs it contains 4 live songs from previous albums. Overdrive's fourth album "EXPLODE" was recorded in 2009 and the band is currently in negotiation with record labels about the release of the album. 4) German disco act produced by Michael Chambosse and Chris Evans-Ironside. 5) OverDrive is a romanian metal band formed in 2009 by 3 bestfriends: Alex(Cretzwoo)-Rhythm Guitar, Mike(Shumu)-Lead Guitar and Soso-Lead/Rhythm Guitar. In October 2009, Andrei-Drums joined the band and in November 2009, Liviu-Bass Guitar came along too. In January 2010 they recorded the song "This is your life" for a local contest with the help of Cosmin Arsene-Vocals. Later, in June 2010 the band got it's 6th member, Gabi-Vocals, the former frontman and bass player of the Cadett band. At the moment, the band consists of 5 members: Gabi(vocals), Shumu(lead guitar), Soso(rhythm guitar), Marius(bass guitar) and Andrei(drums).